Create users in both the client/systems giving the same user name and proper authorizations. We need to use these user ids to logon through the remote connection and perform the IDOC transfers. 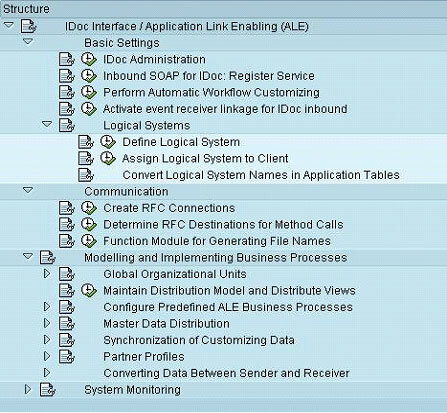 Create logical systems for both sending and receiving systems in both systems. Note: If we are performing this data transfer task for all modules at a Customer site, then we will need to use the appropriate message type and create a new Distribution model. You should get a list in green color which means it executed successfully. You should get a list saying model view is distributed successfully. Find the port from the list which is created using BD64 for SEDCLNT800 (Receiving system) RFC Destination. Check the Basic type as your Basic IDOC object.  In the sending system, select the option to transfer IDOCs immediately.  By default, in the receiving system IDOCS are bunched together and received. Message type defines the 'meaning' of data. It is just a logical entity that gets connected to the Idoc type (in tcode we82) or gets connected to the distribution model (in tcode BD64). If necessary create a new message type. In client 105, go to tcode we81.